At first glance, the Impossible Dovetail seems very aptly named. 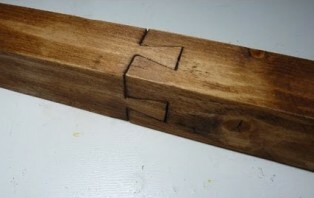 The joint can secure two 2x2 pieces of wood end-to-end, revealing nothing but a tight dovetail pin locked with a corresponding tail on all four sides. It seems inconceivable that the interlocking cuts could be set in place, since dovetails simply don’t plug into each other like extension cords or Legos. But the Impossible Dovetail can be done. And after successfully creating the puzzle, woodworkers get a constant reward from watching friends scratch their heads and try to pull the pieces apart, or turn it over and over, only to discover that each side is exactly like the others. In the following video, piano technician and woodworker Jack Houweling demonstrates a common process in creating the impossible dovetail. By building a jig for the project, Houweling was able to make a series of diagonal cuts, allowing the pieces to slide together at an angle. It isn’t his first design, however. In an earlier posted video, Houweling successfully joins the impossible dovetail by making perpendicular cuts and softening the parts in water so they can be coerced into place without breaking. Though it isn’t the most widely-accepted solution, Houweling’s original design does do the trick, and it utilizes the same methodology that drives other woodworking puzzles like the Impossible Nail or the Pinball in a Wooden Cube. The Impossible Nail and the Pinball in a Wooden Cube both present onlookers with the same question: How is it possible to get a solid piece of metal inside a piece of wood without drilling extra holes or splitting the grain? Both projects rely on the wood’s pliability after a good soak. When a piece of pine is left in water for about a day, then boiled for about 10 minutes, it can be stretched and squashed as easily as a sponge. In another video by Woodworking for Mere Mortals, Steve Ramsey reveals the trick behind the Impossible Nail. It really is astonishing to see the wood spring back to its original shape after being crushed in Steve’s vise. And now since I know the trick behind these woodworking puzzles, my next project will be to find out how shipwrights bend timbers for the hulls of wooden boats. My guess: magic spells.